Geneva Lab Model XL review | What Hi-Fi? One person's brilliant is another's ridiculous, and both words have been used in equal measure when reviewers have come face-to-face with the Geneva XL for the first time. One thing's for sure; it certainly provokes a response. 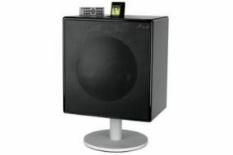 But then, how many other gigantic, 38kg, square iPod docks are out there? You could place the XL on a table-top, but it would have to be darn large and sturdy. Much better is the bespoke stand, which is a £150 premium, but pretty essential in our opinion. The unit's glossy top houses a slot for CDs and a flap that conceals the dock; below, you get line-in and FM connections. The bright display shines clearly through the top-right of the mesh-like fascia, and behind the convex centre section hide two 20cm subwoofers, two 13cm mid-range drivers, and two 2.5cm tweeters, all powered by a 600W Class D amplifier. And, yes, it's got just as much welly as its girth suggests. It's an enjoyable noise, too. Vocals are clear and detailed, cymbals have loads of exciting sparkle, and there's tonnes of chunky bass. The only reservation is that this bass is just a little too rounded, and even over-bearing in anything except a very large room. Of course, the price is a stumbling block, too, and other than the extra volume (both musically and physically) it doesn't offer much over the cheaper Model L – surely we should at least get DAB radio for £1500? And, of course, for the same money you could put together a fully specified and rather exceptional, ‘proper' hi-fi system. However, if you're the kind of person who finds that kind of thing a bit boring and fancies more of a stylish centrepiece that doubles-up as a party-rocking performer, you may just have found your prime candidate.